Hello Gorgeous! The Santa Rosa and Santa Paula of 1958! – Putting the "hip" in "ships" since 2002! Home › Uncategorized › Hello Gorgeous! The Santa Rosa and Santa Paula of 1958! Hello Gorgeous! The Santa Rosa and Santa Paula of 1958! July 23, 2016 – For my maiden post, here are two of my top ten favorite ships, the gorgeous little Grace Lines sisters, the Caribbean and South America cruisers Santa Rosa and the Santa Paula of 1958. When I was first attracted to them, I had no idea they were also the brainchildren of genius naval architect, William Francis Gibbs, who just happened to have designed my all time favorite ship (and the pinnacle of old school liner design), the SS United States. 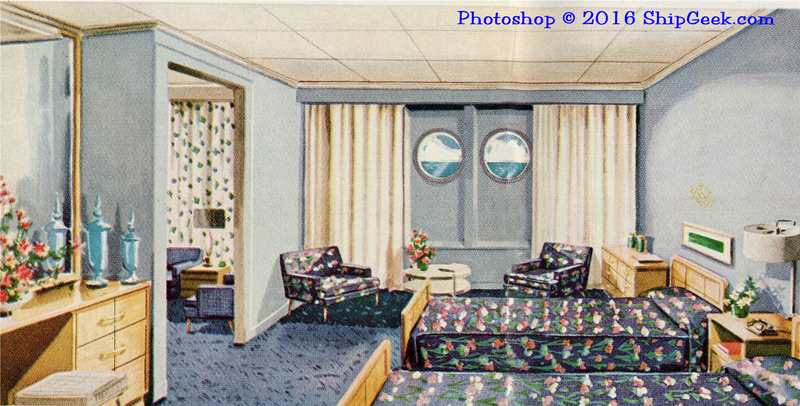 Throw in that all three ships had similar interiors by Dorothy Marckwald, of the New York firm Smyth, Urquhart & Marckwald, who also dressed up the United States, it’s easy to understand the attraction. 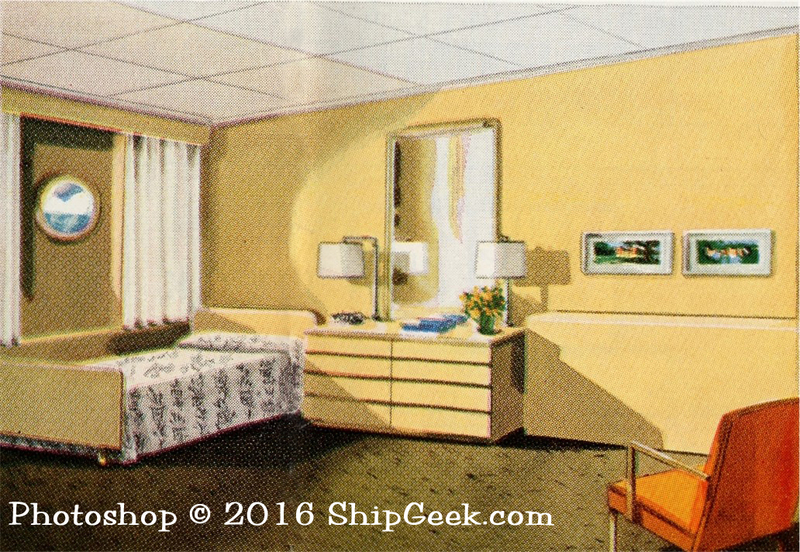 Offered here are some renderings of the ships and their rooms. 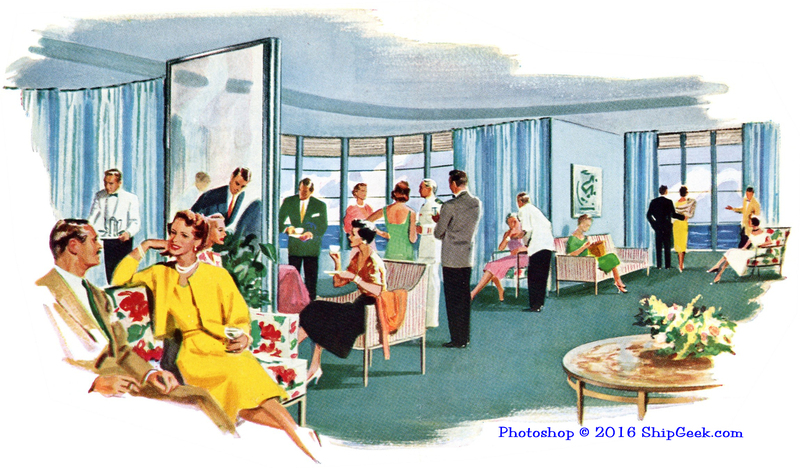 I love this design sensibility from a time when “casual elegance” was known as “swankiness.” The public rooms are particularly delightful. The captions are from the introductory brochure. Enjoy! 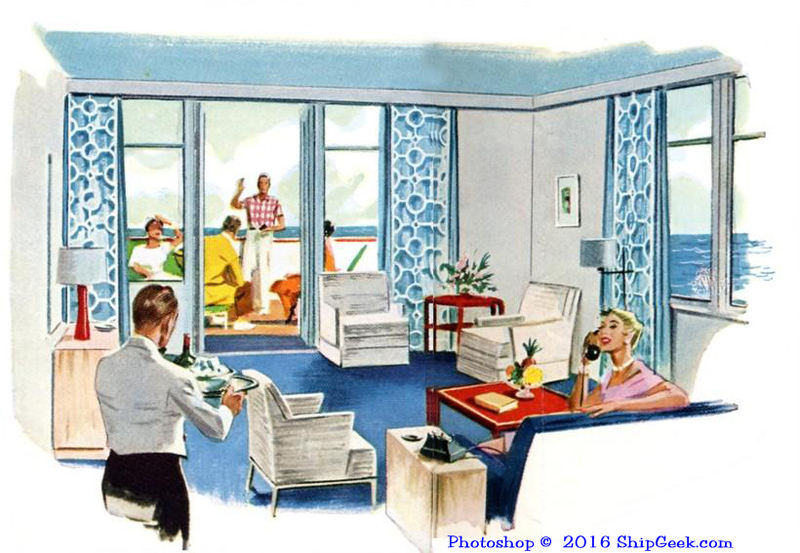 Balcony Suite on the Sun Deck. There are three of these luxurious accommodations on the ship–each lavishly decorated and appointed, and having its own private veranda looking out over the sea. 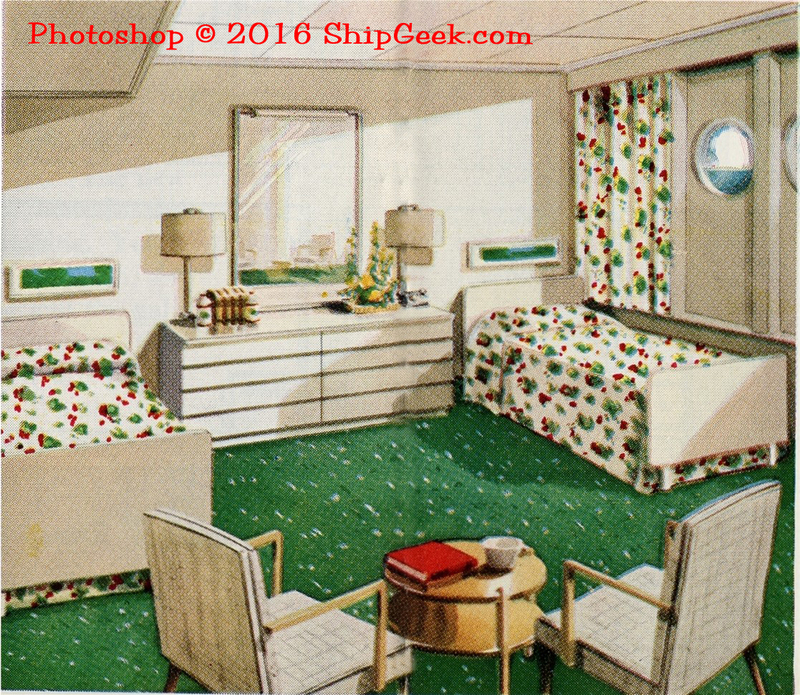 Smartly appointed sitting room of Santander and of other A-deck suites feature the special comfort of an extra bathroom. Typical B-deck double room with twin beds, plus additional upper bed. Another attractive single with additional wall bed. All rooms have individual air-conditioning controls. Quiet charm keynotes the appeal of bedroom in Santander and other A-deck suites. All Santa bedrooms provide private bathrooms and ample trunk space. 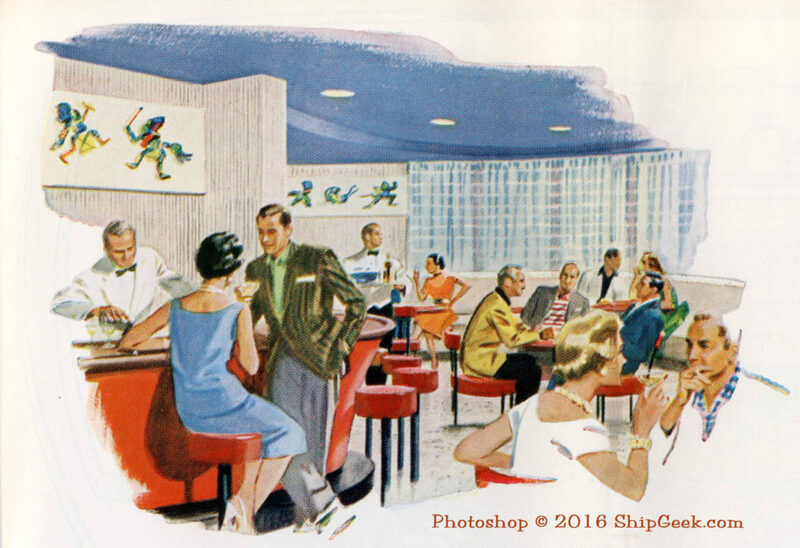 Caribbean Lounge on the Promenade Deck has wide windows affording an ever-changing panorama of sea and sky. 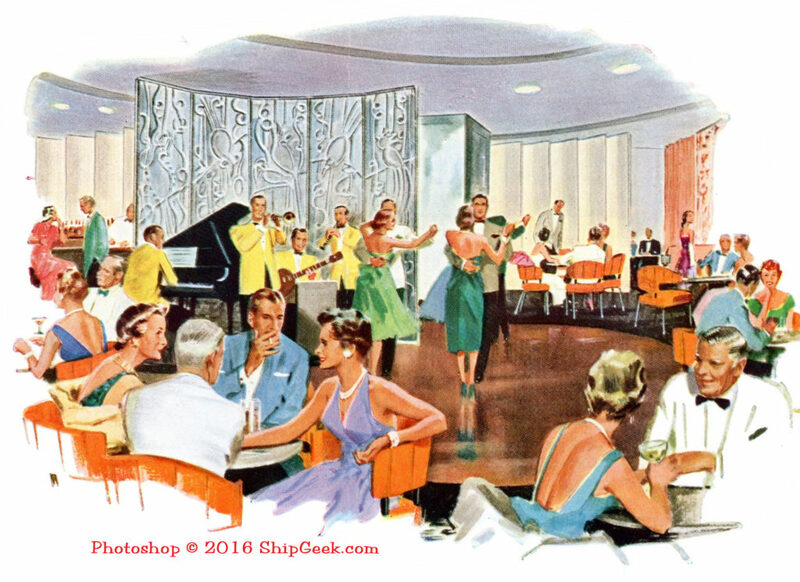 Club Tropicana, with roomy dance floor and bar, on the Promenade Deck. Techo Bar, at the forward end of La Playa, not far from the pool and adjacent to an open-air games area, where you can relax from your activities and enjoy a refreshing drink. I worked for Grace Line in their last year in shipping. I was involved with cargo and passenger baggage operations at Pier 40 North River New York City. I also helped on the U.S. Coast Guard inspections of the “Santa Rosa” and “Santa Paula” during this time. I was with the the “Santa Rosa” and “Santa Paula under Prudential Grace Line, being with these two fine ships in their last drydocking. The saddest part was the layup of both ships in Norfolk Virginia January of 1971. I went to Norfolk with the “Santa Rosa” for layup. It was a very sad time, as these two ships were the last American flag passenger vessels operating on the U.S. east coast. I later worked part time under Prudential Lines and then Delta Lines when they took over the South American Service in 1978. I took care of the “Santa Lucia” class ships on the Caribbean run every other week out of Brooklyn New York. These large freighter carried only 12 passengers, as compared to the 300 passengers on the “Santa Rosa” and “Santa Paula”. As of this year 2018 there no remaining ships of the Grace Line fleet. The “Santa Paula’ was destroyed in 1991 during Dessert Storm by Iraqi in Kuwait and scrapped on sight. 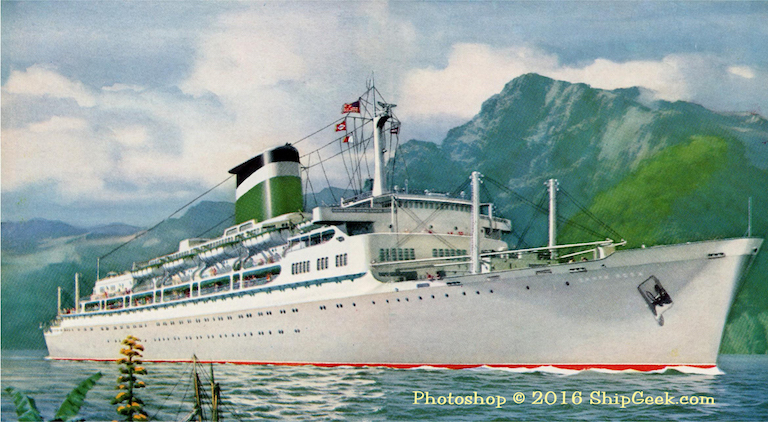 The “Santa Rosa” was crapped as the”Emerald” in Alang India. 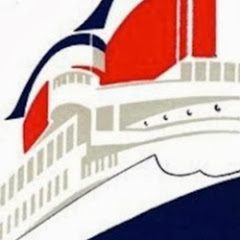 She had a long later life as “Regent Rainbow”, then in 1995 sold and renamed “Emerald.” She still had her original steam turbine engines and B/W boilers in perfect condition when the”Santa Rosa” was scrapped in2012. The remaining Santa fleet, “M” ships(“Santa Magdelena” four sister ships and “L” ships(“Santa Lucia’ and six freighter were all scrapped through 2000 – 2015. These great ships are now just historical maritime memories.